Jakarta - Toyota Global Environment Month is an annual event that is participated by all Toyota affiliates in Asia Pacific and held every June for the International Environment Day on 5 June. 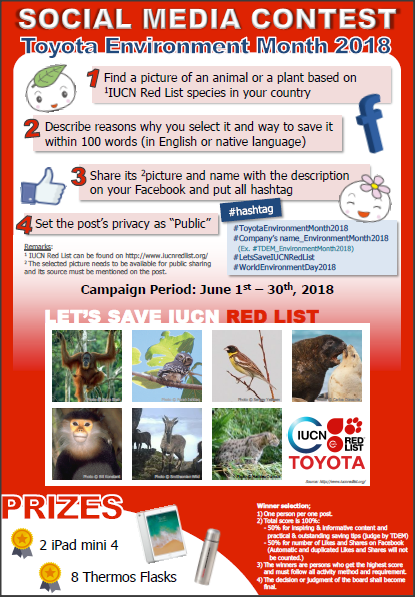 On this occasion, TDEM as Environmental Affairs Office (EN), invites Toyota Indonesia team members to participate in social media contest with the theme "Let's Save IUCN Red List" which last from 1 - 30 June 2018. Don't forget to chage your profile settings to public. Photo description / caption should be as attractive as possible in English or origin language. This contest may only be participated by Toyota Indonesia team member (TAM / TMMIN). Photos uploaded should taken on 1 - 30 June 2018, afterwards are not counted. The calculation of like & share is done on July 1, 2018. Besides that, for each team member who contributes uploading photos will also get interesting souvenirs from TMMIN! Let's upload photos from now and win the prizes! Seminar CSR For Sustainable Business : A Myth or Reality?